April 23, 2018 - Dubai, UAE: Design icons, world premieres, and one of a kind experiences are all part of a thrilling Roger Dubuis 2018 line-up, starting with a first-time appearance and the launch of the Excalibur Aventador S Green watch – for which five patents have been filed – at the prestigious 2018 Geneva International Motor Show alongside partners Pirelli and Lamborghini. The remarkable things that happen when visionary engineers meet incredible watchmakers have forged adrenaline-pumping liaisons between Roger Dubuis and Pirelli on the one hand, and Lamborghini Squadra Corse on the other. The “Perfect Fit” partnership between Pirelli and Roger Dubuis is grounded on their world-first attitude and their passion for performance, driven by materials technology. With Lamborghini Squadra Corse, the Manufacture shares a relationship powered by raging mechanics, daring money-can't-buy customer experiences and a focus on extreme aesthetics. Famed for its own impressive line-up of world premiere and the largest event on the international motoring calendar, this year's Geneva International Motor Show (GIMS 2018) runs from March 8th to 18th. It is the perfect venue to stage the latest priceless creative encounter between two uncontested champions of off-the-radar innovative watchmaking and automotive design. 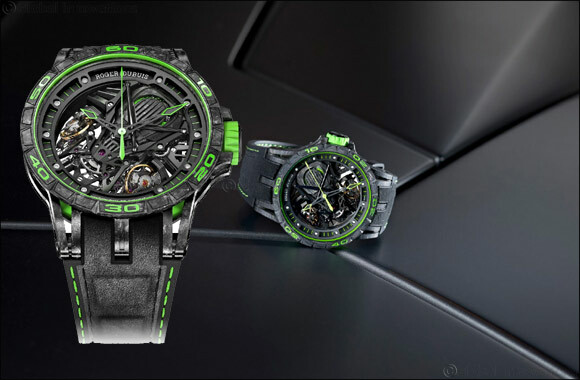 In tribute to the energy that characterises this unique partnership, the 8-piece limited edition Excalibur Aventador S Green watch features a bi-material strap in black and sizzling green, with matching green rubber over-moulding on the case and crown, and green markings on the fluted carbon bezel. In the development of high-performance engines, guaranteeing that each nut and bolt remain in situ is a major concern that is solved by G-force Anti-Ejection Reinforcement. In the Excalibur Aventador S, Roger Dubuis engineers have translated this principle into a self-locking means – named a bouchon de clavette (cotter pin cap) – of maintaining each element in place on the barrel, the heaviest element of any ‘watch engine'. During the show, guests from Lamborghini and Pirelli will have the privilege of an exclusive invitation to the Manufacture Roger Dubuis in Geneva, the home of Swiss watchmaking. In celebration of this action-packed partnership triumvirate and complete with a line-up of Lamborghini supercars, each of these three scheduled visits will feature a dinner surrounded by Roger Dubuis production lines. Yet another money can't buy experience in the very heart of micromechanical engineering.